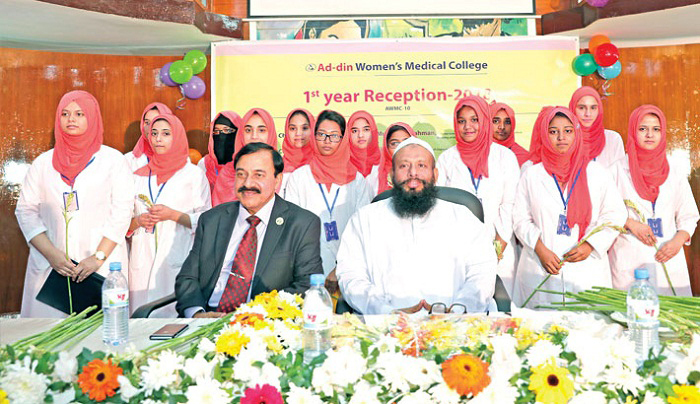 A reception was given to newly enrolled students of Ad-din Women’s Medical College on its Maghbazar campus in the city on Wednesday. The college authorities received new 95 students of the 10th batch at the programme on Wednesday. Director General of Bangladesh Drugs Administration Maj Gen Md. Mostafizur Rahman, Ad-din Women’s Medical College Principal Professor Afiquor Rahman and Ad-din Foundation Executive Director Dr Sheikh Mohiuddin were present at the event. Speaking on the occasion, Drug Administration DG Md Mostafizur Rahman said that medical profession is the noblest profession in the world and they have a great role to serve people. “All of you have begun a new life. You have to lead a disciplined life to become a good doctor,” he said. “We are very much careful to ensure a better future of our students and for that, students have to work hard,” he said.